WE ALSO BUY TRIUMPHS FOR CASH, DISTANCE NO OBJECT, BEST PRICES PAID. Please note if you don't see what you are looking for on the website please give us a ring. Let us deal with the tyrekickers and timewasters and sell your car for you. Available soon, Genuine TR8 EFI, LHD. One of the nicest original cars I have ever seen. Contact me for more details. Genuine factory Triumph TR7 Sprint finished in White with the original Black trim. Genuine factory sprints are rare but this one is the factory Sprint development car. Chassis no ACG5 is the first Sprint made by the factory so a real one off and collectors item. Rescued a few years ago by it's previous owner who is well reknown within the TR7 world, ACG5 has undergone a full strip down nut and bolt restoration with no expense spared to return it to it's original condition. 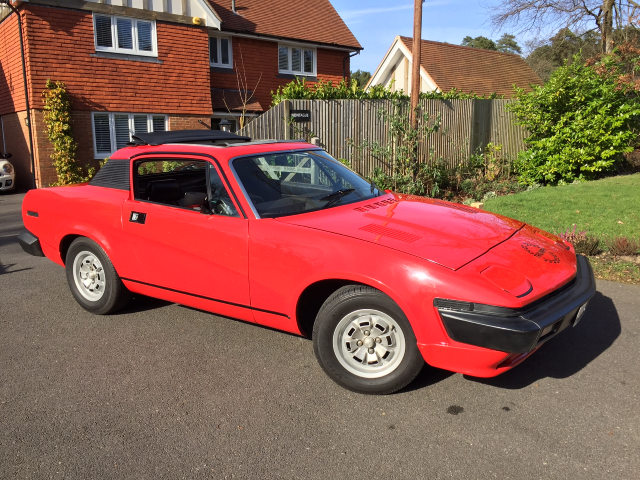 We are pleased to offer this car for sale on behalf of it's current owner, a rare chance to acquire a real piece of TR7 history. Please contact me for more details. We will shortly be listing a number of cars that we are selling on behalf of a customer.These will comprise of both FHC's and DHC's.Please contact me for details prior to them being listed on the site. 1980 Triumph TR7 DHC finished in Red. Converted to Sprint spec with tubular manifold and sports system. This car has been off the road in dry storage for over 10 years. It runs, drives and stops and the engine is really sweet sounding. Exterior body is good but it will need welding to the floors. The hood is Mohair and is in reasonable condition although faded. Make no mistake this is a project car but it is a really good project car with a good spec to start with having the Sprint engine. We can arrange delivery. 1980 Triumph TR7 FHC finished in Black, very rare Premium model with Tan check interior and Gold stripes. Even though 400 of these were made there can only be a handful left, especially in this condition. A very original example that has never been welded, the underside is lovely and the inner wings are perfect. 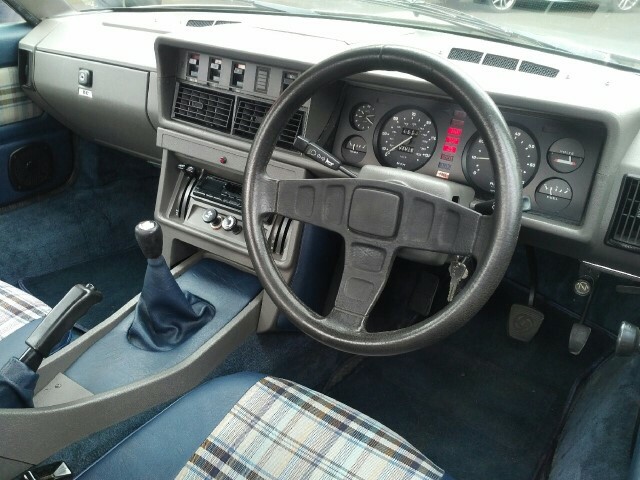 Interior is in great condition and the car drives as it should. MOT'd until May 2019, this car is ready to enjoy. 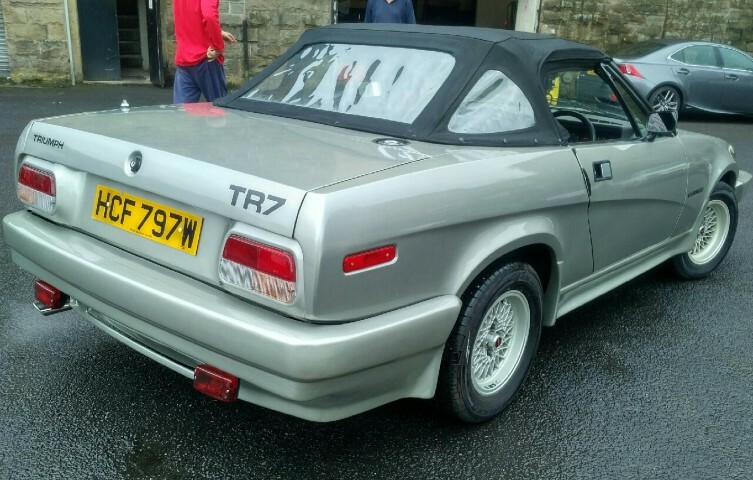 A rare chance to aquire a very rare TR7 model which would only require a few minor improvements to make concours. 1981 Triumph TR7 DHC finished in rare Cavalry Blue with Blue check interior. Push button dash. Lovely original example with loads of new parts fitted including all new uprated suspension and poly bushes. Vented brake kit and Uprated Master Cyl & Servo. New rad with electric fan, electronic ignition. Full stainless sports system including tubular manifold and KN air filters. Recent timing chain. Period 14 inch alloy wheels. New carpet set. Stainless bootrack. Large history file including a recent invoice from us for over £7k. Car will come with new MOT and engine service ready to enjoy. 1980 Triumph TR7 DHC finished in Persian Aqua with Tan interior and Rare Tan hood. Lots of new parts fitted inc most interior parts, radiator, hoses, viscous. Comes with Stainless Steel exhaust, Electronic Ignition, Roll Over Bar fitted and factory alloys. Been off the road for the last few years in dry storage but would come with a full service and a new MOT. A very nice clean example inside and out. The underside is in great original condition. Cars like this are only going one way. 1978 Triumph TR7 FHC Sprint finished in Tahiti Blue with Green check trim. This is a GENUINE factory sprint which has undergone an extensive restoration a few years ago to bring it to the condition you see it today. A very rare car, examples of which rarely come onto the market. The car is on site although I am selling on behalf of a customer. Please note that it comes with the factory alloys fitted and not the steel wheels fitted in the photos. For more information Please give me a call. 979 Triumph TR7 FHC finished in Pageant Blue with Red check interior. Rare solid roof model in great condition. Currently with no MOT and would require some welding the N/S inner flitch, the O/S has been done. We can offer the car as is for you to finish and MOT or we can supply with the welding done and with a full MOT. Good history file. Would make an ideal base for a rally replica. 1982 Triumph TR7 V8 Grinnall DHC finished in Green with Tan check trim and Black Mohair hood. This car has been with it's last owner for 25 years and it was he who had Grinnall do the bodystyling and V8 conversion. All steel Grinnall Bodystyling with SD1 rear light conversion and fitted with Roll over bar. V8 conversion with power steering and SD1 front suspension with modified rear axle and suspension. Stainless steel sports exhaust, compomotive wheels, USA front bumper. Car will come with a new MOT. Bodywork is very good but it will need some TLC and a new doorskin on the N/S at some point. Great car to use over the summer and do the bits over the winter. 1980 Triumph TR7 FHC finished in Platinum Silver with Blue check interior. Car has been off the road for the last few years but it wouldn't take much to recommission. Bodywork is solid with a few areas that would need attention. 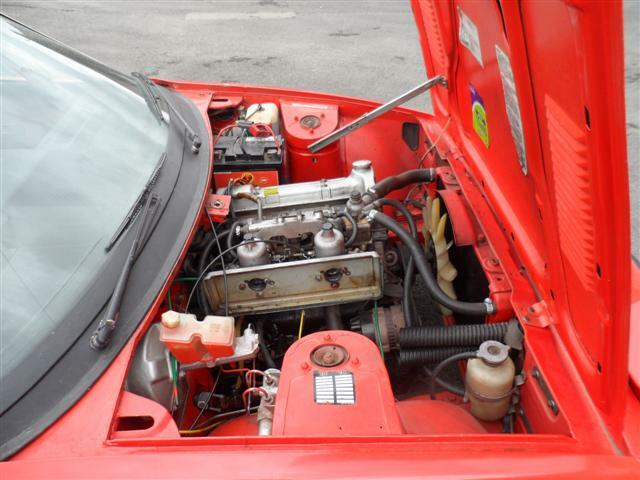 Engine and gearbox are good and the interior is in really good condition. DHC bodyshell, fully restored with bonnet, bootlid, doors and headlampods. Rally front spoiler fitted and flared in. Ready to prep and paint. Save yourself £000's on panels and hundreds of hrs of work. painted on the underside and engine bay and boot area. 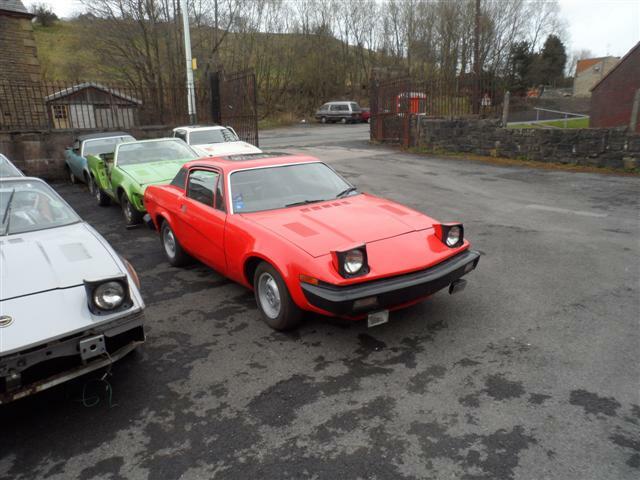 Late model TR7 FHC bodyshell fully restored with no rust. New wings, front panel, recon doors and more fitted. Cheaper than restoring your own and perfect base to build a rally replica from. Comes with, bootlid, doors and headlamp pods. Can be supplied with a NOS roof skin. 1979 Triumph TR7 2 litre Auto, this rare auto car is finished in Java Green with the Green check trim. It is sold as a restoration project but it does run, drive and stop and the car is complete. Would make for a great winter project for someone. 1980 Triumph TR7 DHC finished in Platinum Silver with Blue check trim and Black Mohair hood. 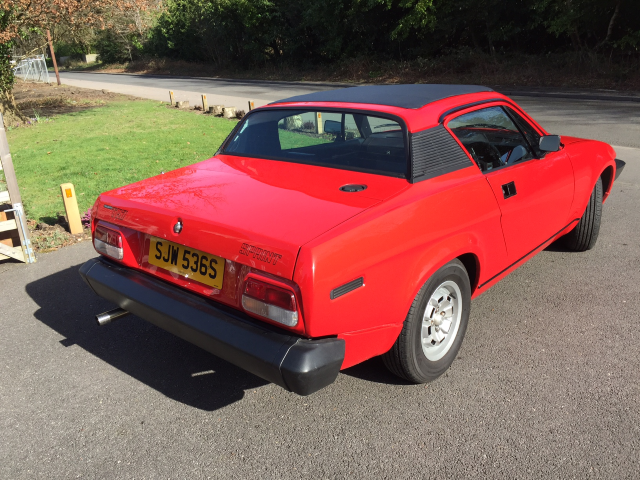 It has bee fitted with what we consider to be the best bodykit available for the TR7, The Viper Kit along with period Compomotive alloy wheels. Tubular manifold and sports exhaust have been fitted to make it sound as it should. An upgraded electric fan is also fitted. The bodywork is in great condition as is the interior. Car comes with a new MOT ready to enjoy. 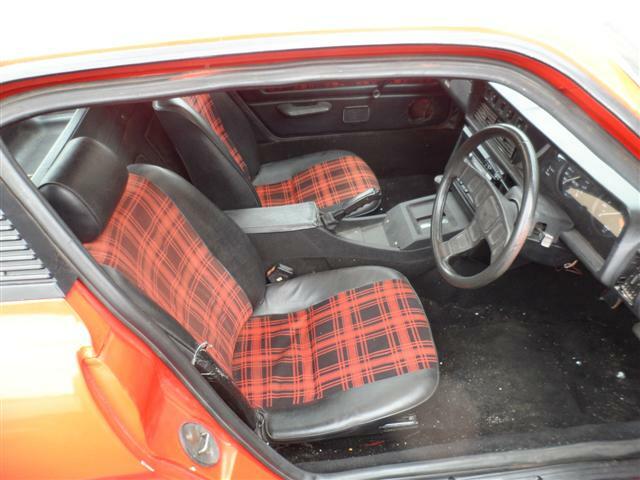 1980 Triumph TR7 V8 DHC finished in Red with a bespoke Black leather interior with Red Stitching. Complemented by a Black Mohair hood and hood cover. The boot is fully carpeted as well. Mechanically it is a 3.5 litre V8 with SU carbs with tubular manifolds and a sports system. The brakes and suspension are uprated. Bodywork is in excellent condition and the car is MOT'd ready to enjoy. 1982 Triumph TR7 DHC finished in Blue metallic with Tan check trim. It is complemented with a mint Tan Hood and matching Hood cover, both factory originals. The car has been owned by the same family for over 20 years and has covered only 47,000 miles from new. The underside is in great original condition and has never been welded. It has had new shocks and springs fitted recently. It is fitted with a Rimmers MK3 bodykit and MGF alloy wheels. The bodykit has been fitted to a very high std. The car is MOT'd and ready to enjoy. Genuine factory TR7 Sprint. Finished in Red with rare grey Spider trim, factory alloys and factory fitted sunroof. This car is in exceptional condition and is ready to enjoy. Please note we are advertising this car on behalf of it's owner and the car is not on our site. If you wish to view the car or require anymore information please contact us. These cars rarely come onto the market so this is a unique opportunity. 1982 Triumph TR7 DHC finished in Red with Black trim. This car has been off the road for a number of years while it underwent a full restoration by it's previous owner who was a panel beater by trade. The new parts fitted are too numerous to list but include body panels, suspension, brakes, interior, exterior trim, engine components, clutch and cooling system. Car will be sold with a full MOT ready to enjoy. 1982 Triumph TR7 FHC finished in Pharoh Gold with Tan check interior and full sunroof. This car has only covered 18500 from new and has been owned by myself for the last 2 years. Never been welded and in original condition with non faded carpets and a rear parcel shelf that hasn't lifted(how many of them do you see) As you can expect this car comes with a large history file and is one for the collector. The car now has it's original refurished factory alloys and is original apart from the Kenlowe electric cooling fan. Lots of period details like the original dealer number plates and rear window sticker. Will come fully serviced and MOT'd. Give me a call for more details. 1982 Triumph TR7 DHC finished in Bordeaux Red with Tan check trim. This car has been off the road since 1995 and was stored in a dry garage on axle stands by it's previous owner. Very original car that has had no welding. The car is showing 35,000 miles, Interior is in great condition. The bodywork is solid although the hood would need to be replaced. The engine is sweet and the gearchange is positive although work would be needed to the brakes for the MOT. I real opportunity for someone to acquire a low mileage car needing minimal work to recommision. 1982 Triumph TR7 FHC finished in Green with Tan check trim. Unfinished project, lots of new parts fitted and work done. GRP wings, bonnet and bootlid. Tubular manifold and sports system. 1982 Triumph TR7 DHC finished in Argent Silver with Blue check interior. This car has been with with the same owner since it was 6 mths old and prior to that it was owned by a Triumph dealer. 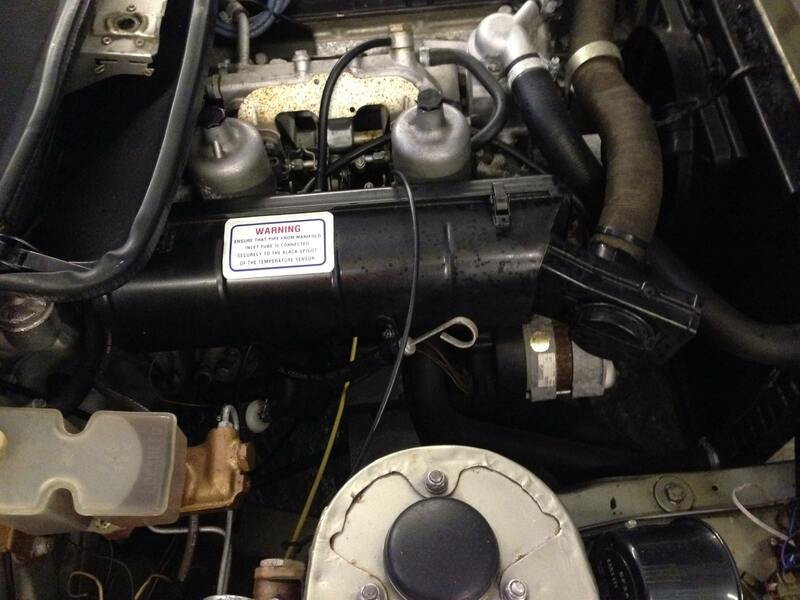 The car is in great all round condition and comes with virtually every MOT of it's life. A great introduction to the world of the TR7. Get in quick before the prices go up. Sold with a full MOT. 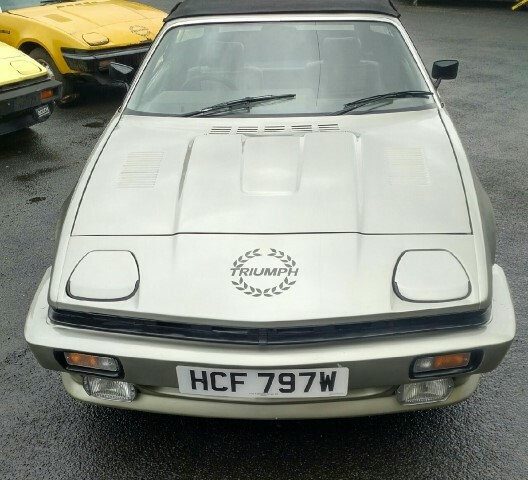 1982 Triumph TR7 DHC finished in White with Black cloth interior and Mohair roof. The car sits well on it's 15 inch period wheels with all good tyres. It benefits from having been fitted with electronic ignition, electric fan and uprated braided clutch hose along with Spax shock absorbers. It is unusual in the fact that it has been converted to 2+2. Ideal for those couples with a dog. Comes with a 12 mth MOT ready to enjoy. 1982 Triumph TR7 DHC finished silver with Blue Trim. Very solid body wise, needs N/S front wing painting. Runs and drives lovely, factory alloys, interior and hood in great condition with carpeted boot trim. Been off the road for a few years so will need MOT, Perfect for the DIYer. 981 Triumph TR7V8 DHC finished in Persian Aqua with Blue check interior. Full V8 conversion by ourselves with all the right parts a number of years ago. Car runs drives and stops well but hasn't been on the road for 12 mths so has no MOT. Offered as you see it for the DIYer to get ready for some summer fun as we just haven't got the time to do it. 15 inch wheels. Will need a hood. Delivery can be arranged at extra cost. 1980 Triumph TR7 16v Sprint DHC finished in Green with Tan interior and vinyl roof. Fitted with a 16 valve sprint engine rebuilt by ourselves a number of years ago along with a tubular manifold and stainless steel sports system. It has had new wings a sills in the past but has been off the road for the last few years. Although it runs and drives it has been off the road for a number of years and would need some work for the MOT. A great project for the DIYer. The sprint conversion parts are alone worth the asking price of the car. 1981 Triumph TR7 DHC finished in Pharoh Gold with Tan check interior. This car benefits from a stainless steels tubular manifold and sports exhaust system. The carbs have been the subject of a very recent rebuild. It has black Mohair hood although 1 side window is split but that could be replaced. It is has a current MOT that runs out in July 2016. The Bodywork is not perfect and would need some attention in the future including the front panel which would need to be replaced. 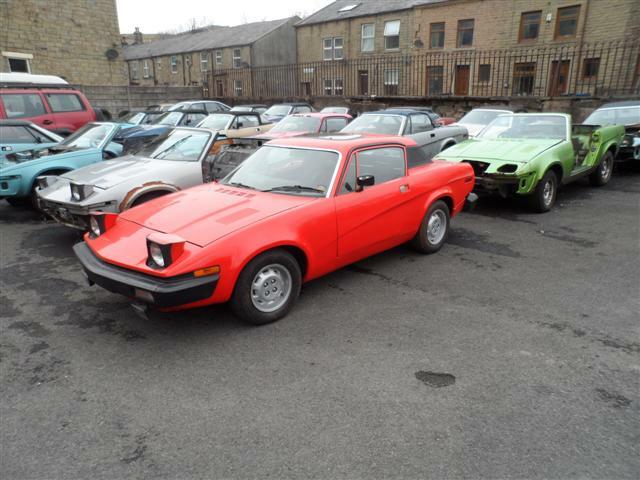 It is a great base for an easy running restoration and is probably the cheapest MOT'd TR7 DHC for sale at the moment. 1981 Triumph TR7 2 litre FHC finished in Red with Blue check trim and factory sunroof.This car has had only 3 previous owners the 2nd of these owning the car from 1982 to 2008.The floorpan is remarkable in the fact that it is unwelded and totally original, the rear link mtgs are as new.It benefits from having new discs and pads as well as new coil springs all round.It drives as good as it looks and has only 19,000 miles on the clock, although this cannot be verified.FHC's are rare and extremely sought after especially examples in this condition.The factory alloys have been polished and the centres finished in a contrasting Black.The interior, sunroof and boot trim are as new. Prices for cars like this are only going one way. Triumph TR7 V8 Rally Car ready to race, rally, track or hillclimb. Built to an exacting specification with no expense spared. If you bought the parts to build it it would cost more than we are asking for the car. Please note that this car is also fully road legal. 1979 Triumph TR7V8 FHC finished in traditional Russet Brown with Red check interior. Period glass sunroof. Full V8 conversion with uprated brakes and suspension. Holley carb and tubular manifolds. 15 inch Wheels. Bodywork is in great condition but engine needs a core plug. Perfect for a Rally Replica and a very easy winter project to make ready for spring. 1980 Triumph TR7 2 litre DHC finished in Platinum Silver with original Blue check interior trim and Black vinyl roof. Pretty much standard apart from a stainless exhaust, 53k miles, 11 mths MOT. Bodywork and trim are in very nice condition. 1982 Triumph TR7 2 litre DHC finished in red with Blue check trim and Black vinyl hood.This is a one owner from new car and comes with a large history file with most MOT's and the original purchase invoice.It is in very good condition and is taxed and MOT'd until May 2015.Comes with the original supplying dealer rear number plate and window sticker. Spare wheel is unused. Ready to use and enjoy. 1980 Triumph TR7V8 DHC finished in Mettallic Blue with Black leather interior. 15 inch MGF alloy wheels, Recent Mohair Hood. Loads of time and money spent on the electrics to include details like automatic door locking when moving, LED's etc.Uprated brakes and suspension, 4 barral carb. Pwr steering.There are a few details that need to be finished but that is reflected in the price. 1982 Triumph TR7 FHC finished in Red with Blue check interior.Late model FHC's are becoming increasing rare.Fitted with a original factory sunroof and alloy wheels, both of which are in excellent condition as is the interior. 1980 Triumph TR7V8 finished in Red with Blue Velour Trim and Blue Mohair Hood.This car was one of our original demo cars and has been with the owner we sold it to since 1987 until it came back into our hands. 3.5 litre V8 with Holley carb, tubular manifolds and sports exhaust.UR brakes and suspension along with a 3.08:1 final drive.Battery in the boot, 14 inch Revolution wheels and a sound track to die for.Has many original TR8 parts fitted and has been featured in "Fast Car" magazine as well as our first sales brochure( copies included) Comes with a 12 mth MOT. Triumph TR7V8 DHC finished in white with Blue/Black interior trim and Black Mohair Hood. This car has had no expense spared to bring it to this specification and condition.It is fitted with a 3.5 litre EFI V8 with stage 3 polished and ported heads, Rear disc axle with LSD, Large Hi Spec brake kit, uprated suspension, electric power steering along with Bespoke instruments, luggage and boot trim.The owner has had the 15 inch wheels specially made at great expense to keep the retro appearance of the car.It also has been fitted with an LPG conversion.For more information on this very unique car please give us a call. Please note that the car doesn't come with the number plate shown. 1979 Triumph TR8 efi DHC LHD, this is not a conversion this is a genuine factory car.Built in 1979 it is believed to be one of the earliest factory drophead TR8's. Originally supplied to the North American market with factory EFI, Power steering(which has recently been rebuilt) and factory air conditioning although the compressor has been removed(easy to return to full working order).It is finished in Posieden Green with Tan check interior and a TR8 steering wheel.The hood has been replaced at sometime with a Black Mohair item rather than the original vinyl.It sits on aftermarket 13 inch Minilite wheels but a set of original factory alloys can be fitted if required.It is not mint but it is in very good condition having never been welded and would not take a lot to bring up to a really nice condition.A rare opportunity to aquire a rare car. 1980 Triumph TR7 V8 DHC finished in the popular Persian Aqua with Grey/Blue trim.The seats are from an XR3 and make for a great seating position.Blue Mohair hood is also fitted. The engine is a 3.5 lire V8 with twin SU carbs with original TR8 cast manifolds and a stainless steel twin exhaust.The axle ratio is 3.08:1.The front brakes have been uprated to a vented kit with EBC discs.The suspension has also been uprated. 981 Triumph TR7 V8 FHC Unfinished Project.This is probably the easiest project to finish we have ever offered for sale for the DIY'er.It has had no expense spared by it's previous owner having had a professional body restoration and repaint.The car is almost complete with a fully rebuilt and not yet run 3.5 litre V8 engine, new clutch, new uprated vented brakes, all new suspension including KYB Shocks and poly bushes.A new fuel tank has been fitted along with new fuel and brake lines including braided hoses.A battery in the boot kit is fitted.The interior is the standard Tan Check and has had a new headlining fitted.The Engine and gearbox are fitted to the car as is all the brakes, suspension and radiator.The previous owner purchased one of our V8 conversion kits to do the conversion and all the parts not fitted are supplied with the car as you can see from the pics.To finish it needs the prop, exhaust system and headlamp assy fitting along with the cooling system plumbing in.The engine bay wiring loom would need to be fitted along with the wiring for the new electric fan.The fan itself is already fitted to the car.Once a few other jobs are done it will be ready for the road.Comes complete with pictures and all invoices and 2 sets of keys. 1981 TR7 DHC 2 litre finished in Red with Tan check trim.Very sound car that has been stored for the last few years by it's previous owner.Runs and drives and has the benefit of having had a lot of new parts fitted including an electric fan system. The N/S headlamp motor would need replacing and the door panels have been removed although they are with the car.Although it doesn't have an MOT this would make an easy winter project for someone. 1980 TR7 DHC 2 litre finished in Platinum Silver with original Blue Check trim and Black vinyl hood.This car has had only 2 previous owners, the last one having bought the car when it was around 6 mths old.It has not been on the road for the last 10 years.There a some minor repairs required to the exterior and the car would require a complete repaint to bring back to mint condition.The underside however is totally original and solid having never been welded.The mileometer reads only 16,000 miles from new and although this cannot be varified, the general patina of the trim and car in general bares this out.The car runs and drives and the engine and gearbox are sweet. We are happy to supply the car as it is or with all the work done. 1980 TR7V8 FHC Unfinished Project. Full 3.5 V8 with 5 speed box fitted with uprated suspension.As you can see the rear lights have been modifed to take the SD1 units which come with the car.We can supply an original rear light panel and lights to convert back to std if required.Tubular manifolds and a performance exhaust are fitted and the front as been modified to accept the larger SD1 radiator which is fitted.The dash is fitted but there is no other interior parts in the car.Loads of potential for a track, hillclimb or rally replica.Loads of work already done on the body including fitting one of our MK2 rally spoilers.Body is in primer ready for painting. 1978 TR7V8 FHC Auto finished in Red with Black trim.Converted by ourselves for the last owner to our Stage 2 Conversion Spec with the addition of uprated suspension and a 3.08:1 final drive in the axle.At the same time it was also converted to Automatic using a brand new Auto box and torque convertor and cooler.It is also fitted with leather seats and full sunroof and 14 inch Minilite replica wheels.Mot'd until next August. If required this car could be easily converted to manual, please ask for details. 1982 TR7 FHC 2 litre finished in Red with Tan check trim.This is one of the last cars to come off the production with the very late push button controls for the trip and clock through the dash.FHC's in this condition have become very rare in recent times and are very much sought after.We have looked after this car for a number of years and the owners have spared no expense on it's upkeep and upgrade.The car benefits from having had fitted a full S&S Supertune kit 1, 15 Compomotive AT wheels with all good tyres, Poly bushes front and rear along with KYB shocks and uprated springs.Uprated master cyl and servo, New Rad with electric fan system.Electronic ignition, oil cooler and pressure gauge.It has had a recent new alternator and is fitted with a CD multichanger in the boot.MOT'd until next October. 980 Triumph TR7 V8 DHC finished in Dark Green metallic with original Tan check trim interior.As you would expect the brakes and suspension have been uprated along with the final drive in the axle. It also benefits from having been fitted with Power Steering and many genuine TR8 parts have been used in the conversion. The car is a real credit to it's former owner and comes as you would expect a large history file complete with photographs. Here we have a rare opportunity for an enthusiastic DIY restorer to restore an iconic Triumph Stag. This 1973 model has been stored in a garage in the condition you see it now for the last 23 years. 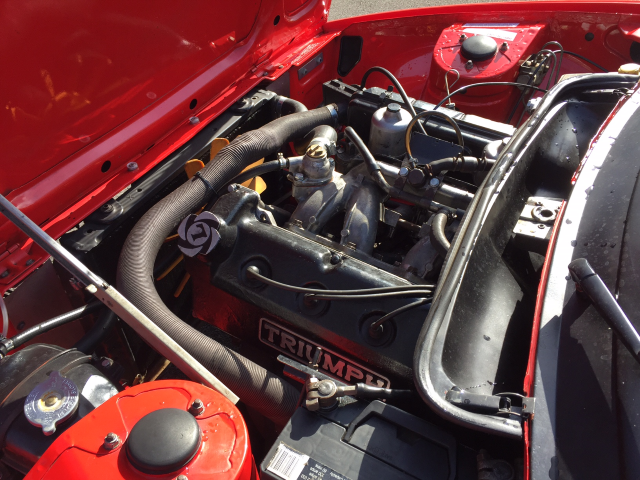 It has the original 3.0 litre Triumph V8 engine with a manual overdrive gearbox. Perfect project for the up coming winter months. 1977 Triumph TR7 FHC finished IN Bright Orange with Red Check trim.Very rare Automatic model.Car is an unfinished project with no MOT but it does run and drive and would only require minimal work to finish.Really good bodyshell with good original inner wings and floorpan. 1982 Triumph TR7 DHC finished in metallic Silver with Blue Check trim.This car is fitted with 14 inch Minilite wheels stainless steel exhaust and is in superb condition throughout.It also benefits from having had the roller bearing top mount modification.Tax'd until the end of Nov this year and MOT'd until May next year, this car is ready to enjoy. 1982 Triumph TR7 DHC finished in metallic Silver with Blue Check trim.Only 2 owners from new with the last having owned the car for the last 28 years.This car has only covered 51,000 miles and is in exceptional condition both inside and out.It is taxed and MOT'd ready to enjoy the summer if we ever get one. 1980 Triumph TR7 DHC finished in Red with Blue chek trim.Good cheap open top car, ideal for someone that likes to improve their car while still using it.Comes with a 12 mth MOT. 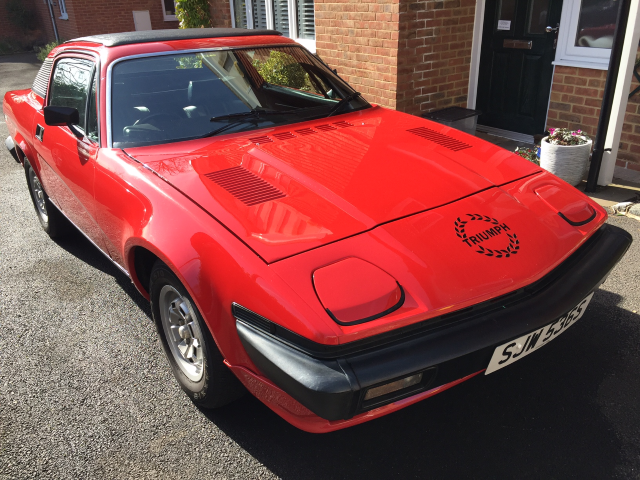 1980 Triumph TR7 DHC finished in dark Red Metallic with Blue check trim and Black Mohair hood and factory alloy wheels.A very solid and well maintained car in great condition with a Good history.Great car for the first time TR owner.Comes with a 12 month MOT ready to enjoy. 1977 MGB GT finished in Black with Grey Striped trim.A very nice example of this sought after GT.It has had a new clutch and battery fitted along with KN air filters and comes with a full MOT ready to enjoy. 1979 Triumph TR7 FHC finished in Brooklands Green with matching Green Tartan interior trim and original Green carpets.Sports exhaust and a recent new fuel tank.Very nice condition inside and out, runs and drives well.MOT until Sept this year.80k miles only. Very rare FHC with no sunroof and 5 speed gearbox. 979 Triumph TR7 V8 DHC finished in metallic Dark Blue with Blue velour interior and matching Blue mohair hood.This car was the subject of a complete restoration by ourselves and was converted to V8 spec at the same time.Minilite replica wheels complete the period look.The brakes and suspension have all been uprated and the final drive has been converted to 3.08:1.It is a 3.5 litre engine with Holley carb and tubular manifolds.The car is in excellent condition ready to enjoy. 977 Triumph TR7 FHC 2 litre finished in dark Red with original Black chord trim and Grey carpets.It is rare to find an early fixed without a sunroof and especially rare to find one like this.Same owner for the last 17 years and has a fully rebuilt engine around a 1000mls ago.Car comes with a full MOT. 1982 Triumph TR7 FHC 2 litre finished in Red with original Tan Check trim.Full factory sunroof and factory alloy wheels.No expense has been spared maintaining and upgrading this car.Improvements include a new radiator with electric fan, oil cooler with spin on filter conversion, uprated brake master cyl & servo, poly bushes & KYB shocks all round, Roller brg top mts, SS exhaust and many more new parts too numerous to list.The car comes with an extensive history file with MOT certificates dating back to 1985.The car is in excellent condition throughout and would come with a new MOT.FHC like this are becoming a rare find. 1971 Triumph TR6 PI, 150bhp model finished BRG with Tan leather interior,This car has been cherished and has wanted for nothing.Recent improvements have been to fit a fully reconditioned gearbox/overdrive unit along with a new clutch.The differential has been rebuilt, the suspension has been upgraded and poly bushes fitted along with new brakes.As you can see the car is fitted with the period wire wheels.The interior has been retrimmed in Tan with a walnut dash and black carpets.A mohair is fitted and the car comes with all it's weather protection, tonneau etc.A nice touch is the button start and the car is fully alarmed and comes with 2 sets of keys. 981 Triumph TR7 V8 finished in Black with Black trim.Converted by ourselves to our Stage 2 Specification with an axle ratio change for a previous owner this car has since had a vented brake and suspension upgrade.Nice condition bodily and represents a cheap introduction to the world of V8 open top motoring. 1981 Triumph TR7 V8 DHC finished in Silver.This car has been fully restored by ourselves and benefits from uprated brakes, suspension and a 3.08:1 final drive ratio.Blue Mohair roof with the original Blue check interior and new Blue carpets.This car is close to original TR8 spec with the battery located in the boot, original cast manifolds and a 4 box SS exhaust system.Perfect and ready to enjoy some Spring motoring. 981 Triumph TR7 DHC finished in BRG with Tan Check Trim.Although the car is complete it is a non runner because of an head gasket problem.Ideal restoration project for someone who wants to go the V8 route as well.